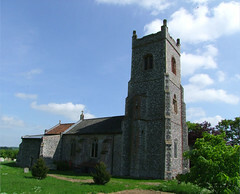 Of the four medieval churches of this parish, two survive, with the ruin of a third, St Martin, immediately beside St Mary. 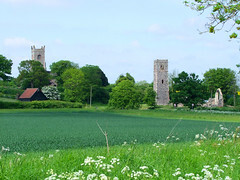 All Saints, the other working church, is near to the centre of the pretty village in the rolling hills south of Norwich, but St Mary sits dramatically beside its ruined twin on a hilltop, with just a large farmhouse for company. It is a remote church, and as such you might expect it to have fallen to redundancy. 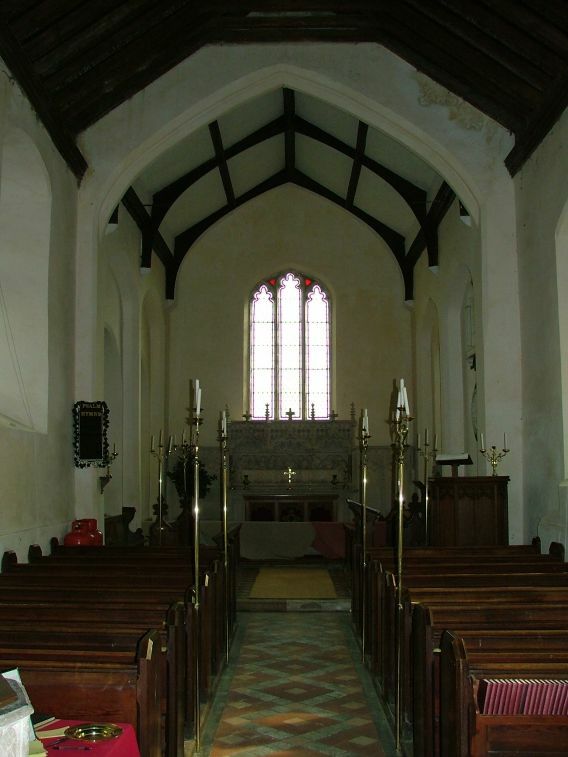 There is no electricity, no permanent heating, but it is still in use, for which the parish is to be much admired. It is also a surprisingly large church, and the tower is particularly handsome with details picked out in red brick. 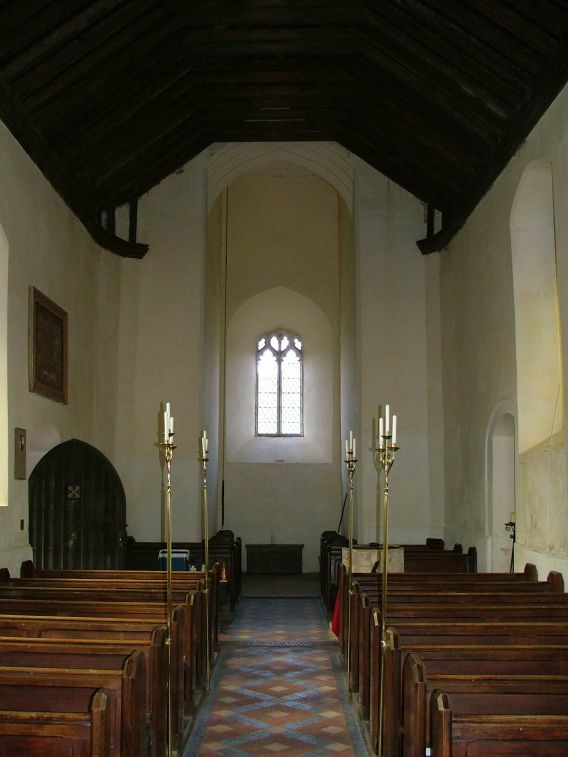 There is much red brick in the nave wall, and a substantial north aisle. 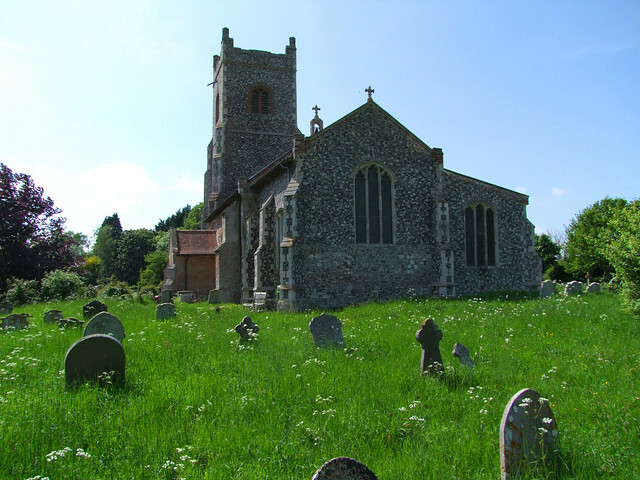 This is, like its neighbour across the valley, an early church which looks late medieval because of strategic rebuildings in the late 15th and early 16th centuries. The windows here seem to be all 19th century, adding another layer of disguise. You step into an atmospheric interior, a common feeling in a lonely church. Although the 19th century restoration here was a fairly substantial one, there is still the rustic feel of a simple country church here, probably because not much has been done since. 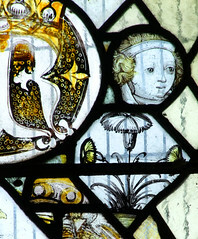 And there are some good medieval survivals, not least some medieval glass which has been reset in the aisle window. 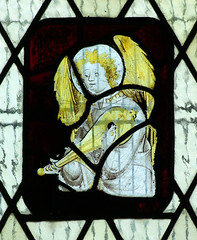 One pane depicts an angel musician playing a lute. 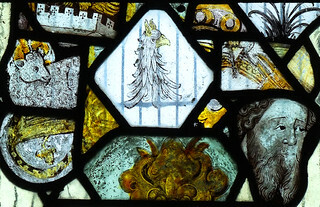 The other is a composite of pleasing fragments: some faces, flowers, a sheep, an eagle, a heraldic device. 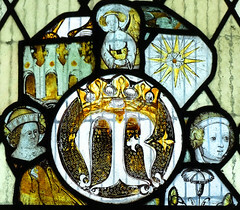 They are arranged about a Marian monogram. Nearby, the piscina is an odd thing. It has been surrounded by terracotta tiles depicting heraldic animals, which probably came from an early 16th century tomb. Another odd thing is a banner stave locker - there is another across the road at St Martin. 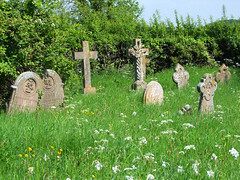 Again I was given cause to wonder why such things are only found in this part of Norfolk and Suffolk. 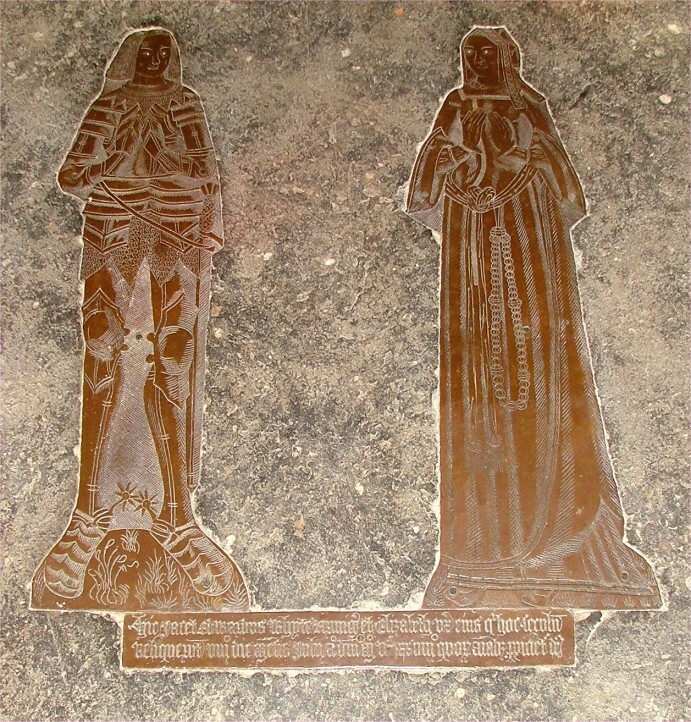 There is a very fine 1528 double figure brass under the carpet in the middle of the chancel which is particularly interesting because it depicts a civilian wearing armour. 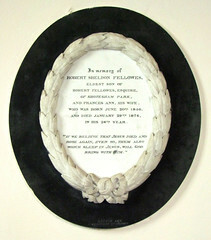 He is Edward Whyte, she his wife Elizabeth. The inscription records that they died of the 'sweating sickness', that virulent killer of the middle ages which would die out within half a century. 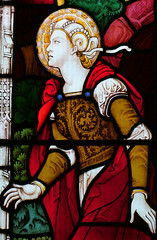 From a later era, St Mary has a William IV royal arms. 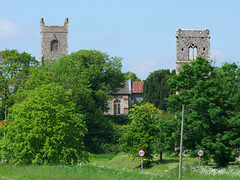 Unusual in itself, there is another one across the valley at Shotesham All Saints. The chancel is somewhat dominated by one of those massive off-the-shelf stone reredoses depicting the Last Supper under vaulting, which were produced in their thousands at the start of the 20th century. 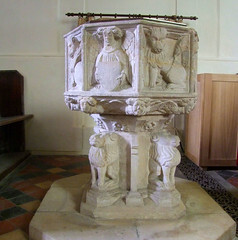 Happier is the beautiful 15th century font, an ur-example of the East Anglian style, angels and evangelistic symbols around the bowl and proud lions about the stem. 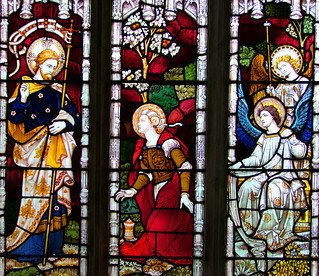 And the parish, too, should be proud of their continued care and use of this fine church.